The state Legislature’s top elected official unveiled skepticism of reports last week that criminal lobbying was conducted as a means to craft the state’s lucrative tax break program. 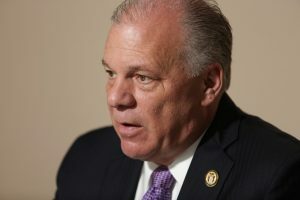 “Everyone agrees that the public should scrutinize state spending, which is why the task force must say who is being investigated, what law was broken, and which law enforcement agency was notified,” said Sweeney, an ardent supporter of the tax credit program, known as Grow New Jersey. It is not clear to whom the referral was made. The Democratic governor unveiled the task force – armed with subpoena power – through an executive order in January following an audit which found the state lacked considerable oversight and administration of the tax breaks, allowing corruption to run rampant. The task force is chaired by Rutgers Law School Professor Ronald Chen and staffed by several former white-collar prosecutors from the law firm Walden Macht & Haran LLP. Their next meeting is scheduled for May 2 in Newark. The Economic Development Authority is tasked with overseeing Grow NJ and many other economic incentive programs. Several activist groups last week delivered a letter calling for the largely Christie-appointed EDA board to resign, arguing they allowed corruption, mismanagement and abuse of Grow NJ to run rampant these past several years.